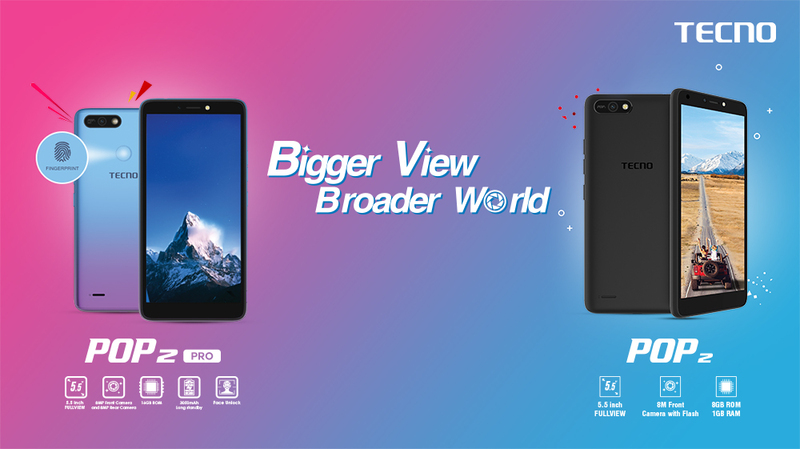 TECNO Mobile has recently launched two of the most astounding devices in the entry level smartphone market which have been rightly named as POP 2 and POP 2 Pro, as these have just popped out to take over the leading role. The biggest take and advantage in the pocket of these two phones IS TECNO Mobile’s partnership with Google to give it a platform for most advance amongst the list of Android versions. POP 2 and POP 2 Pro run an Android Oreo System (Go edition) which is specially engineered and optimized to offer the consumers a smooth and much responsive experience and usage on the entry level devices who comparatively have less RAM than mid-level and high end phones. The chipset of both these phones is MT6580M with processor clocked at a speed of 1.3 GHz. Besides the needful optimization offered by the Android Oreo, POP duo also boast re-imagined Google apps like Google Go, YouTube Go, and the Google Assistant for Android (Go edition) and an enhanced data efficiency. These apps not only give the users a full command over their choices but tailor them according to what their actual needs. For example YouTube Go offers users the choice of opting video size and quality (between basic, standard and high quality) even before watching extending the liberty to users to have a complete control over their spent data. These duos have a slim design that makes them not only easy to handle and use but also adds to their uniqueness by encompassing a beautifully designed bezel screen. POP 2 and POP 2 Pro have a 1 GB RAM, significant to get the regular tasks done very easily. POP 2 has been provisioned with an internal memory of 8 GB while its upgraded version, the POP 2 Pro has a memory of 16 GB. The story of POP 2 Pro continues much further as it has also been layered with a 0.3sFingerprint Quick Snap to ensure the privacy of user. POP 2 and POP 2 Pro both have been installed with a 5.5’ IPS full view Capacitive Multitouch screen. The front camera of Pop 2 and Pop 2 Pro is 8 MP while the Rear camera of Pop 2 has power of 5 MP, while Pop 2 Pro has an 8 MP rear shooter. Both of the rear cameras of POP 2 and POP 2 Pro accompany Auto focus, an HDR mode and a dual flash. The easy to grab and elegantly designed POP 2 at a price of PKR/- 9,499 and POP 2 Pro at PKR/- 12,999 are easily available in three enchanting colors which are Midnight Black, Champagne Gold and City Blue.